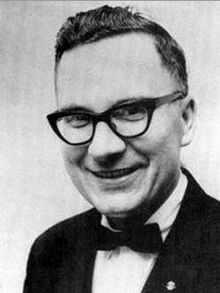 Albert K. Bender (June 16, 1921 – March 29, 2016) author of the 1962 nonfiction book Flying Saucers and the Three Men, was one of the most influential UFOlogists of the 1950s/60s. He served in the United States Army Air Forces during World War II. He was obsessed with the UFO phenomenon and became a UFO researcher, founding the International Flying Saucers Bureau. In 1965 he founded the Max Steiner Music Society. Albert Bender was born on June 16, 1921 in Duryea, Pennsylvania. He lived with his stepfather. Bender worked as a factory clerk. He was drawn to the supernatural; he fashioned haunted house decorations and horror movie scenes on his walls. :183 He attended high school in West Pittston, Pennsylvania. Bender was even featured in a newspaper article when he was 18 for writing to people all over the world. He wrote letters to correspondents in various countries including Peru, England, Romania and Japan. These letters were up to 20 pages long. His goal was to collect things from different countries, like coins or sand, through writing his correspondences. During high school he was also part of the American Youth League and was elected the Jr. Vice President in January 1941 and was also elected national treasure in October of that same year. He visited Ottawa, Ontario, Canada for one week in August 1941. He moved from Pennsylvania around 1944. To express his thoughts, he kept a journal and wrote spook plays. Bender was Protestant. Bender enrolled in the United States Army Air Corps during World War II in 1942. He was stationed at Fort George G. Meade as a dental technician and later transferred to Langley, Virginia. He worked there as a clerk for the Dental Center. He also became was an editor for an Army newspaper in Langely. He later went to Bridgeport, Connecticut. After believing to have experienced a supernatural encounter in 1953, he was married on October 18, 1954 to Betty Rose. She believed that she had also been visited by supernatural personages. He founded the International Flying Saucer Bureau (IFSB) (the first major civilian UFO club in the world) in 1952. Although the organization was a success at first, he suddenly shut it down in 1953. Bender later told that in March 1953 he had been approached by three men in black. These men visited him in his house and communicated with him telepathically. He received a metal disk from them and instruction. He reported that he felt like he was being transported. These men apparently shared insights into the nature of UFOs. These men shared the origin of UFOs with Bender. Afterwards he became ill and didn't eat for three days. As a result of the visitation, Bender felt encouraged to share what he had seen with other UFO investigators, but was refused. Bender suffered frequent headaches after the three men visited him and his co-workers reported that he seemed scared. His alleged experiences were recorded in They Knew Too Much about Flying Saucers by Gray Barker, Bender's IFSB associate. Bender's experience formed "the legend of the men in black." Bender did not speak of the event for nine years. In 1962, Bender wrote Flying Saucers and the Three Men to tell his own story. In the book, Bender recounts that the men in black were from another planet. Barker published his book, but there is speculation that Bender's experience was only a dream. Bender went on to manage a motel in California. 'SPACE REVIEW' was the official magazine about ufology news at that time in 1953. Late in the summer of 1953, Bender made a series of discoveries, which led him to believe that he had finally found the truth to the UFO cover-up. He had planned to reveal his findings in the October issue of the Space Review, but before the issue was published, Bender was visited by three "men dressed in black," who had already read the unpublished report and confirmed his findings. The "silencers" as he called them, scared Bender to the point where he did not publish the report, but left a warning: "We advise those engaged in saucer work to please be very cautious." Bender then suspended publishing on his publication and dissolved the IFSB. Albert K. Bender founded the Max Steiner Music Society in 1965. It was joined by actors John Wayne, Fred Astaire, and Vincent Price. They published a journal and a newsletter. The society officially ended in 1981. Bender has helped locate materials and information about Steiner's career. Albert K. Bender's the first involving the so-called Men In Black[clarification needed] which was inspired by Gray Barker introduced a concept Men in Black which comic book written by Lowell Cunningham, which in turn inspired a popular film and animated television series. As a result, many elements of Bender's fantastical tale can still be found today, in programs like Futurama, The Matrix, X-Files, and countless others. Albert K Bender and Famous Film Music Composer - Max Steiner . Albert K Bender and Max Steiner's Wife. Wikimedia Commons has media related to Albert K. Bender. ^ a b c d e f g Husar, Ruth (11 Jul 1962). "A. K. Bender Authors Book on Flying Saucer Insight". The Bridgeport Post. Retrieved 19 May 2016. ^ a b c Gulyas, Aaron John (May 6, 2013). Extraterrestrials and the American Zeitgeist: Alien Contact Tales Since the 1950s. McFarland. Retrieved 18 May 2016. ^ "Local Students Corresponds With Persons All Over World". Wilkes-Barr Times Leader, the Evening News. 19 Jul 1939. Retrieved 19 May 2016. ^ "State Officers of Youth League". Pittston Gazette. 10 Oct 1940. Retrieved 19 May 2016. ^ "Youth League Elects Bender". Wilkes-Barr Times Leader, the Evening News. 7 Oct 1940. Retrieved 19 May 2016. ^ "West Pittston". Wilkes-Barr Times Leader, the Evening News. 4 Aug 1941. Retrieved 19 May 2016. ^ a b Beckwith, Ethel (May 15, 1952). "Don't Be Afraid, Darling; It's Bender". Sunday Herald. ^ "News of Local Boys in Service". Wilkes-Barr Times Leader, Evening News. 15 Jan 1943. Retrieved 19 May 2016. ^ a b c d The Editors of Publications International, Ltd. "Men in Black". How Stuff Works: Science. Retrieved 18 May 2016. ^ "Albert Bender to Wed Betty Rose Saturday". The Bridgeport Telegram. 13 Oct 1954. Retrieved 19 May 2016. ^ "Origin of World Contact Day". Roswell Books. Archived from the original on 29 May 2016. Retrieved 29 May 2016. ^ a b "MIBs, UFOs, and the Carlos Allende Letters". UFO Evidence: Scientific Study of the UFO Phenomenon and the Search for Extraterrestrial Life. Retrieved 18 May 2016. ^ Wegele, Peter (24 Apr 2014). Max Steiner: Composing, Casablanca, and the Golden Age of Film Music. Rowman & Littlefield. p. 81. ISBN 9781442231139. Retrieved 18 May 2016. ^ Finding aid author: James V. D'Arc (1996). "Register of the Max Steiner Collection". Prepared for the L. Tom Perry Special Collections, Provo, UT. Retrieved May 18, 2016.